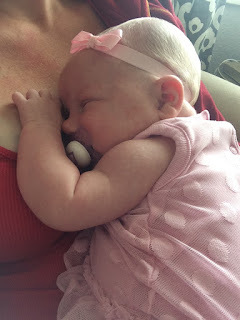 On July 28th our little peanut turned one month old. ...and then needed a nap on mommy's chest, her favorite place to be. She had some solo time with mom and dad while the big kiddos went to the lake for a few days. We all enjoyed some special bonding time with her. She sleeps in her rock n play next to our bed for easy access in the middle of the night feedings. She eats about every 3 hours around the clock. Occasionally in the night she will go 4 hours and during the day sometimes we only make it 2.5 hours. She has a few wake periods - after her 8am feeding and generally in the evening. She poops A LOT, almost every feeding! She has peed on daddy a couple of times while he changes her, she hasn't gotten me yet! Her siblings LOVE her, fight to hold her daily and give lots and lots of kisses and hugs. Solon and Vera are very helpful in caring for from getting diapers to a change of clothes to shouting "volcano" when she erupts again! will sit in mamaroo or reclined high chair for about 10-15 minutes but then gets fussy and wants to be held! Has been to a parade, Adventureland, shopping at the mall and her siblings' activities and has been such a sweetie everywhere we go -- she is quite flexible and doesn't mind her carseat. She smiled at mommy at 1 month and 1 day old - heart.melted. She is just the sweetest little baby and we love her so much. It's as if our hearts always knew her and she sneaks in deeper and deeper into them every single day! She is easy going and loves to be held and kissed and doted on...and we love doing it! Happy 1 month baby girl, stop growing so fast...stay little a little longer...so I can snuggle you up!